Videssa® Breast is the first protein-based blood test of its kind for the early and accurate detection of breast cancer. In women who present with abnormal mammogram results, the decision whether to order additional imaging or biopsy can be difficult. With a simple blood draw, Videssa Breast can inform whether further diagnostic procedures may be warranted or provide assurance by ruling out breast cancer. When used in combination with imaging, Videssa Breast improves diagnostic accuracy and provides greater confidence and clarity when clinical assessment is challenging. Videssa Breast detects real-time disease status, unlike other tests that determine the future risk developing breast cancer. Results are not affected by breast density therefore, Videssa Breast allows for earlier and more accurate detection of breast cancer. When imaging results are unclear, Videssa Breast provides healthcare providers and patients actionable information to support decision-making. Confident Answers to the Difficult Question: "Does My Patient Have Breast Cancer?" A missed diagnosis. A false positive biopsy. These are stressful outcomes and failures for the patient. 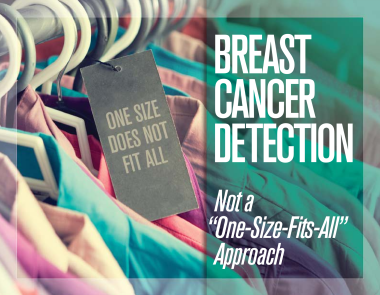 Clinical evaluation and imaging technologies are critical elements in the detection of breast cancer, yet the rate of false positives results associated with these diagnostic approaches significantly impacts patient care, and have not changed significantly over the last decade. Videssa Breast can dramatically reduce the total number of biopsies. When utilizing Videssa Breast the number of false positive biopsies also significantly decreases. Videssa Breast can more accurately identify patients who need a biopsy. One of every three biopsies recommended by Videssa Breast resulted in a cancer diagnosis, whereas imaging caught cancer in only one out of six that were biopsied. When Videssa Breast results are combined with imaging, 100 percent of cancers were caught. Videssa Breast offers clarity for healthcare providers who must navigate complex decisions in women who present with difficult-to-interpret mammography results. Videssa Breast's ability to lower the rate of false positives, without compromising the ability to catch existing cancers, means healthcare providers can confidently counsel patients and reduce use of further diagnostics, including biopsy and additional imaging. Results from two prospectively-collected, blinded, randomized, multi-center clinical trials demonstrate the ability of Videssa Breast to identify breast cancer's unique protein signature in women ages 25 to 75. The trials were conducted in collaboration with 15 breast cancer centers across the United States and enrolled women who had a BI-RADS 3 (probably benign) or BI-RADS 4 (suspicious) finding on imaging.